HE Cyclones are designed to separate product from an air stream. The collected product is discharged from the bottom of the cyclone and the clean air is discharged through the top exhaust. The Ultra High-Efficiency Cyclone does not have bags, which results in all product being returned to the process. The AV-2 and AV-4 filters are fitted with either two or four filters. They are ideally suited for cleaning air vented from rotary air locks and surge hoppers and for venting small volumes of displaced air. AVS Filters have square housing and are ideally designed for use with storage tanks, work bins, and similar applications. 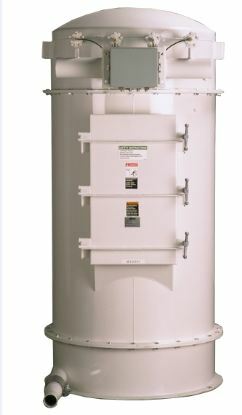 Designed for vacuum, pressure, and combination vacuum/pressure bulk material handling and dust collection systems. Cylindrical shape enhances housing strength for operation at higher pressures than standard AVS models. The ST is similar to the AVS Filter, but with top removal. The filter media is installed and removed through the clean air plenum of the filter. The RT is similar to the AVR Filter, but with top removal. Filter media is installed and removed through the topside, or clean air plenum of the filter. RPT is designed for topside bag replacement. They have rectangular housings and clean air plenums with hinged top doors for easy access to the tube sheet and filters. The bottom removal filters are designed to handle medium to high air volumes.